I can add custom text to mugs or change the colors of the graphics. If you would like something other than what is shown write it here. If not, just write N/A or leave it blank. Items with custom text can not be returned. 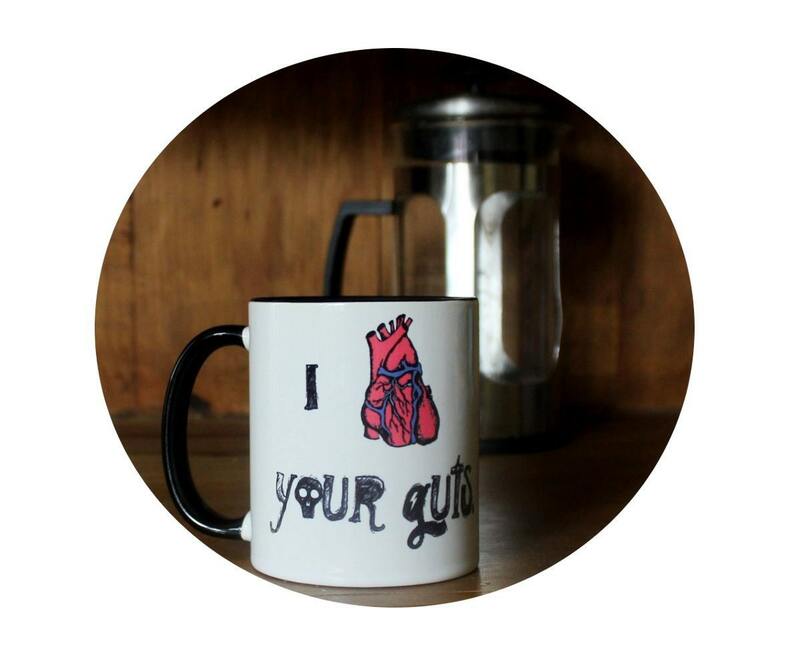 This 11 oz ceramic "I love your guts" mug is sublimated by me in my shop with my own art. This is a drawing of a skeleton skater! I can add text, change the color of the image, or customize in a variety of ways. This is a standard sized mug. You may choose a white mug with black interior and handle, or a white mug. Sales are final on personalized and custom items. ANY image in my shop can be sublimated on to a mug. Enjoy coffee, espresso, hot chocolate, tea or any other beverage in these mugs! The mug shown in photos is a sample, you will be mailed a new item. This item is made to order. Care info: For maximum product performance, we suggest hand-washing or top-rack dishwashing for all sublimation mugs.